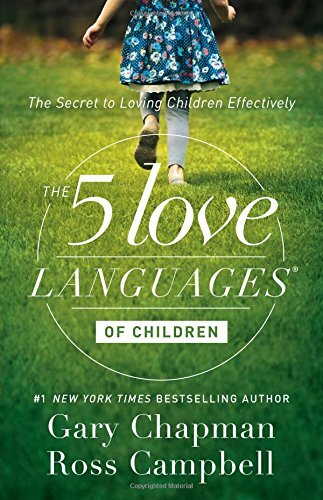 If you are wanting to dive into reading in Spanish, take a look at these titles. I recommend starting with Isabel Allende, a very popular author. All her works have also been translated into English, though, I do think you should read it in Spanish first. Or the book Martín Rivas, a love story. You can read more about it at the end of the post. Juan Rulfo is a Mexican author, well-known for his book Pedro Páramo. This is a very famous book that even Gabriel García Marquez has said had memorized. Other authors have also considered Pedro Páramo to be a masterpiece. Mario Benedetti is an Uruguayan author, he took more a political style of writing later on in his life. His book, Andamios, tells the story of a man who returned to Uruguay after being exiled from his country. Definitely a very, very good book. His writing takes you right to the scene he is describing. Another great title by him is La Tregua. Isabel Allende is a very well-known Chilean author. Most of her works also depict the political / cultural climate lived during military dictatorship. Two of my favorite books by her are Hija de la Fortuna (Daughter of Fortune) and De Amor y de Sombra. Jorge Luis Borges is a very well-known Argentinian author. His book Laberintos is one of his best works. Ernesto Sabato, also from Argentina is well-known for his novel, El Túnel. 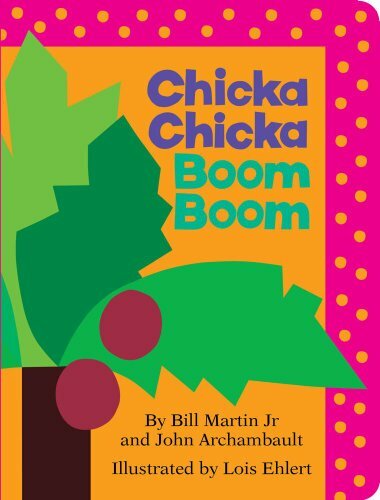 Just about every high-schooler ends up reading this book during their senior year. This is the story of an artist who falls in love with a woman, when she appreciated his art in a way that nobody else had before. This leads to a series of events which lead to tragedy. Gabriel García Márquez is a Colombian author. His most famous works include 100 Años de Soledad and Amor en Tiempo de Cólera. Alberto Blest Gana is a Chilean author. One of his best works is Martîn Rivas, where he writes about the gap between social classes and the love between Martín and Leonor. I can’t recommend this book enough. If there is one title from this list that you should read, this one is very VERY good!!! A real classic of Chilean Spanish Literature. Martín is a poor boy and Leonor comes from upper class when they fall in love. Of course, the culture is such that such differences don’t allow them to be together. You have to read this story to find out how they deal with the circumstances. Have you read any novels in Spanish? What have you read? Have you heard of any of these authors? Keep checking this page, which will be updated throughout the rest of the week and next week with current deals to help you achieve the goals of your homeschool. 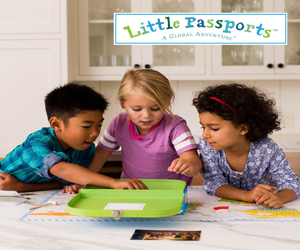 Little Passports has a deal offering their best deal all year, save up to $40! LOVE this subscription box that teaches culture, language (indirectly), and geography. Take monthly field trips around the world through Little Passports. Promo Codes available: BF10, BF20, BF40. Bramble Box available in Canada, also! 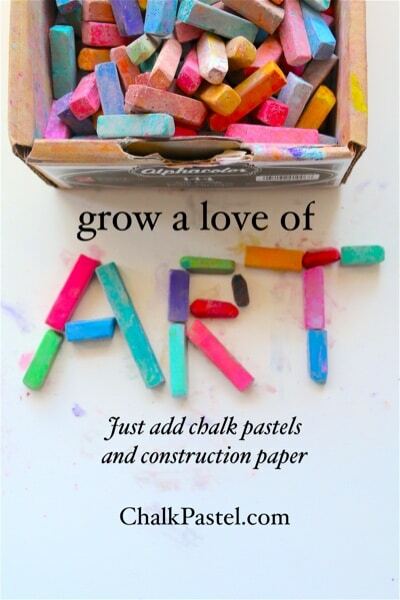 Mom hand-curated activity boxes for kids age 3-7. Perfect for keeping the younger children occupied while learning and teaching a Math lesson with an older child! They have a 10% OFF for Black Friday and Cyber Monday. Mona MELisa Designs is 20% OFF right now. 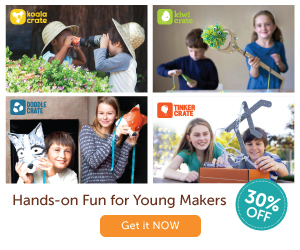 Their products promote Hands-On learning. Great for any curriculum, honestly. Several match up with Classical Conversations; could also be used with Charlotte Mason. The Maestro Classics 12 CD Music Collection comes with music cds and 24 page activity book. I mean, talk about a way to teach classical music. 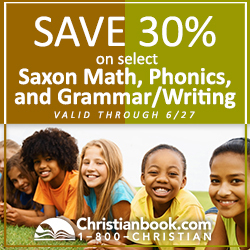 This beautiful set, a total investment for your homeschool. Classical music relaxes and teaches melody, composition, and the beauty of the arts. Check the link to see what it includes. 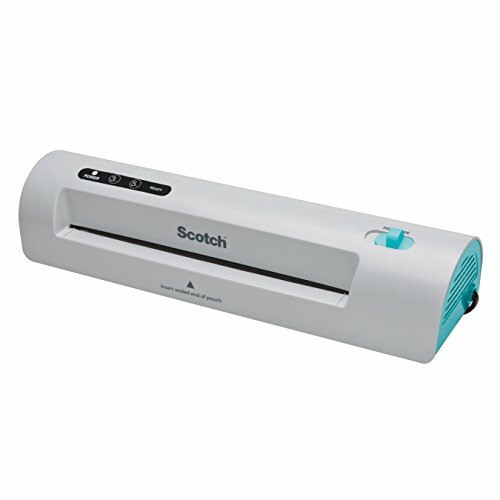 Scholasticlots of fun things to do and educational. FREE SHIPPING! Bonus Buy: Any new member will get the premium content snack videos ($20 value) absolutely FREE. There will be 4 videos showing your children how to use the food processor, how to separate eggs, and how to find healthy snacks. 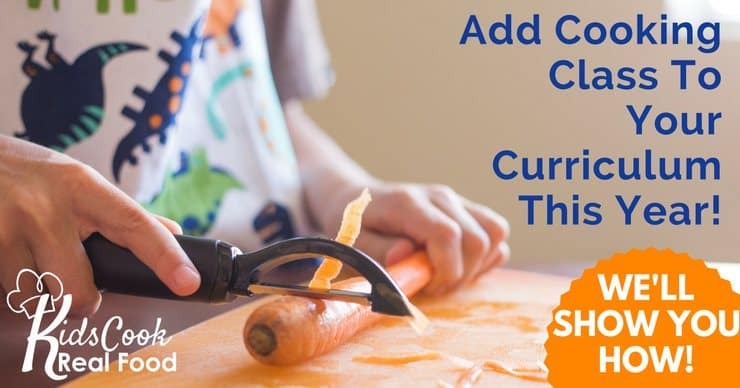 There will be engaging demo videos that will teach your children to make homemade crunchy granola, energy bites, and pumpkin pie bars. Check it out here. 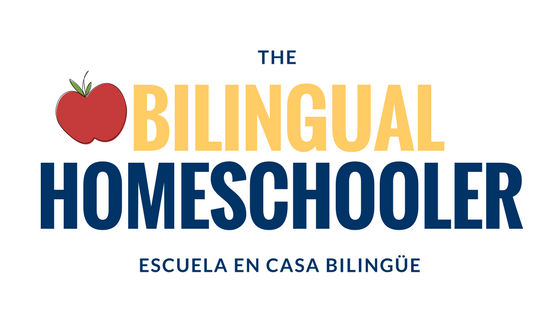 You want your toddler, preschooler, early elementary child to learn Spanish in a fun way, hands-on, without it really seeming like a language class. Red se dice rojo. Repeat. Two se dice dos. Repeat. Here you will find a running list of ideas for games and ways to teach content in Spanish to young children. These are the very same things they will need to learn in their first language (i.e. English). 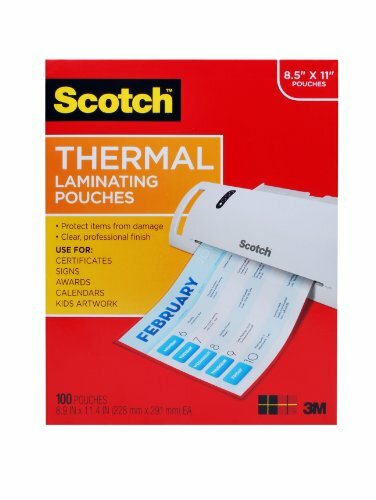 Using these items, they will be expanding their Spanish vocabulary in an effortless manner. The kids will find entertainment putting this large cardboard Spanish floor puzzle together. 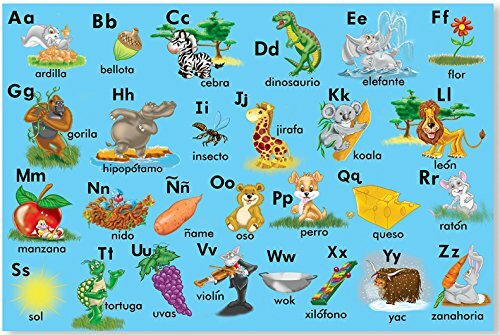 Melissa & Doug Spanish Alphabet Jumbo Jigsaw Floor Puzzle. 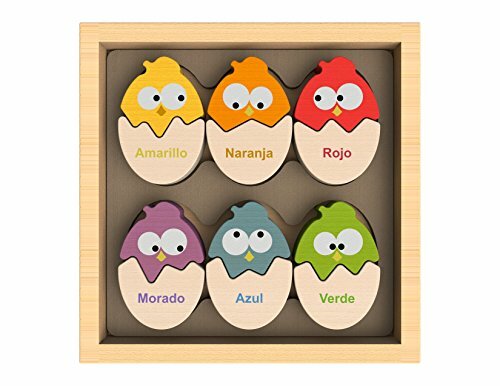 It promotes early literacy, letter recognition, letter-object recognition, and Spanish language skills. 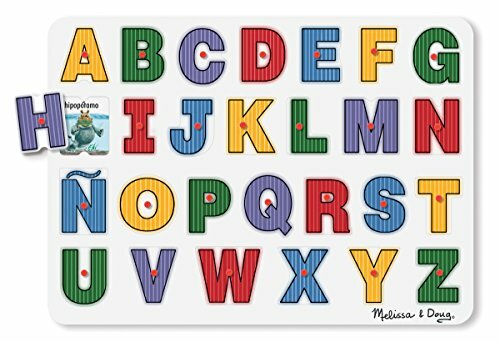 Another great puzzle option is this wooden one, Melissa & Doug See-Inside Spanish Alphabet Wooden Peg Puzzle. You could also put word-object puzzles together like this one that uses a picture, the word for the object in English at the top, the Spanish on the bottom. This puzzle could be used for a long time, a great asset for the homeschool as well. You could work on spelling, making sentences (or silly ones! ), story starters, etc. It can be done independently as well, since it is self-checking. 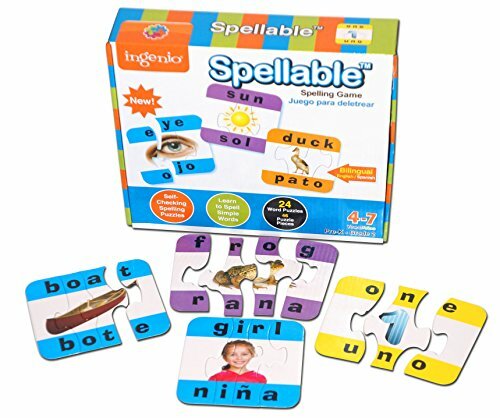 Ingenio Spellable Bilingual Spelling Game helps children build vocabulary in English and Spanish. Children love to learn new songs, dance to music. Why not get them a new Music CD with fun Spanish songs? They will build on vocabulary and learn to say new sentences without even meaning to! 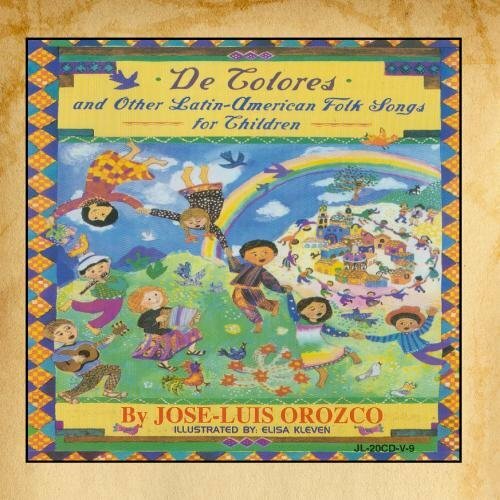 Coloreando: Traditional Songs for Children in Spanish is available as a CD. You can hear a preview of each of the songs and purchase one at a time if desired. Another option for Spanish music is José Luis Orosco de Colores. It has traditional songs, his voice sounds really nice, nice music. I even sing along! As a homeschooling family, much time is spent gathered around our dinner table. It is the place where we eat, yes, but it is so much more than that. Our dinner table is the place where we do school, make crafts – even messy ones, the place where my kids get to help cook different meals, the place where we read and paint. Our dinner table is the place where many of our family memories are being made. Our table is scratched, stained with different colors of oil paint and it is okay with us. We realize this is just a season in our lives. Someday, we may have a new table with zero scratches and perfectly looking wood. However, the fact that my table is the way it is signifies that it is loved by a group of people. I would not have it any other way. As we spend even more time around the table, I am going to delve into Sally Clarkson’s new book, The Life Giving Table. She is such a candid, well-spoken, sincere woman. 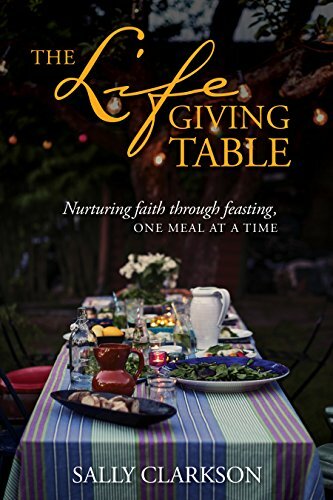 I look forward to her new book and learning more ways about to make my table more Giving than it already is. 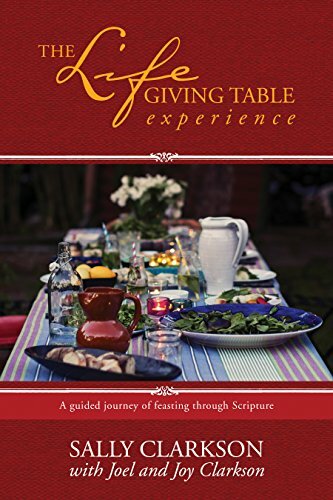 Sally Clarkson’s book, The Life Giving Table, is an inspiration to make the most of the time we spend gathered around this wooden table. Her book is inspiring us to grow, to connect, and to invest our time during meals into more than eating food, but to be together as a family where many of our memories are being made. Her book also comes with a companion book to help digest the content of her book into applicable lessons. In some ways, my dining table makes me think of the book The Giving Tree. Our table gives, gives, and gives. This is the place where gather to make memories, to pray, to read our Bibles, where we have conversations, where we work hard to edify one another. Our table is the place where we put our phones away to just be with one another. As we enjoy meals, read books, take pictures, spend time together, our table is the place where our fondest memories are being made to last a lifetime. Research also shows that families that eat together are healthier and closer. Children who have a healthy experience around the table are also healthier adults later on in life. The table is a place to cherish one another, build each other up, engage in conversation, hear jokes, hear about each other’s day, ask questions, answer questions. The table is the place to be together. The table is the place to be united. The table is the place to grow in love. The table is the place to grow closer together as a family and closer to God. The maker of all things. What is your Life Giving Table like? Will you be reading Sally Clarkson’s new book? Let me know in the comments. Nature Study is a VERY important component of our eclectic homeschool. We enjoy spending time outside, walking, observing plants, bugs, trees, leaves, etc. God’s Creation is so beautiful and intrinsic; there is always something new to learn about outside. Charlotte Mason hit the nail on the head when she coined that children should spend time outside playing, in nature, observing, LEARNING from nature. Since even before we officially began to homeschool, we had spent time outside just in nature. Sometimes walking a trail, other times even in the backyard observing the plants that are in our home. My advice to you is to become familiar with the flora and fauna you have in your area. Visit natural museums or look up books about your state’s nature. Palm trees are local to Florida whereas Michigan has willow trees and pine trees everywhere. Take advantage of those geographical differences to discover and learn about nature right where you are. So many times when going on nature walks, we stop to observe tiny caterpillars or worms. The kids wish we could take them home to continue observing them. This Bug Catcher and Viewer helps us transport the bug to our garden to continue our observations. This set comes with an Insect Magnifier, a Catcher, and 2 tweezers to pick up bugs without actually touching them. We have found that using a Bug-Catching Net is really useful for catching butterflies, look at, and release. Sometimes we snap a quick picture of it, or another insect, to read about in the book Caterpillars, Bugs and Butterflies: Take-Along Guide (Take Along Guides) . This Outdoor Set for Kids – Binoculars, Flashlight, Compass & Magnifying Glass is actually in my wish list . It is a very complete set that would be great to use when going on a hike, so the kids could bird watch from a distance through the binoculars. They could also use the compass for finding the direction we are walking while looking at a map. Nature study is a natural way of learning and appreciating the world around us. It also raises consciousness in caring for everything around us like animals and plants. Go ahead and go to your backyard to enjoy, discover, and learn about what surrounds you!